While the income inequality controversy started as a sociological and public policy debate, Compensation Committees should have a strong understanding of the relationship between public company executive compensation and income inequality. The impending disclosure of the ratio of CEO to median employee pay in 2018 proxy statements, as required under Dodd-Frank, will dramatically bring such discussions into the Compensation Committee in the near future. Supporters of the CEO pay ratio believe that this disclosure will reduce “excessive” CEO pay and lower the pay multiple. Many blame “overpaid’ executives subject to weak boards and poor corporate governance for being the primary cause of US income inequality. This is not accurate. While corporate executives are paid well, public company executives represent a smaller portion of the highest .1% in more recent times than they did in the mid-1990s. Additionally, for the top .1%, growth in public company executive compensation actually lags the growth in private company executive pay and finance professional pay over the same 13-year time period. Pay Governance’s analyses of realizable pay for performance indicate that pay-for-performance is operating among US companies. Improvements in corporate governance practices combined with similar executive pay levels and designs for private company executives suggest that high levels of public company CEO pay are not the result of corporate governance failure. Further, widespread investor support for say-on-pay votes in the past six years indicate broad investor support of the current executive compensation regime. We make strong arguments that the CEO pay ratio for a particular company will be indicative of market-driven industry, size and performance factors rather than a failure of corporate governance. As Compensation Committees consider the context of inequality issues and executive compensation decisions, Committees should focus on robust corporate governance practices, independent advice, and the company’s strategy for addressing the disclosure of the ratio of CEO to median employee pay in 2018. At a recent Compensation Committee meeting, a director remarked, “As we discuss our CEO’s target compensation for next year, we need to remember that there is an ongoing debate about income inequality.” Income inequality and executive compensation are two of the most controversial issues in modern American economic and political discourse. The forthcoming mandated disclosure of the CEO pay ratio will link these two issues directly in the boardroom. Many critics blame the rise in inequality over the past 20 years partially or heavily on the rise in public company CEO compensation. These critics use the “300 to 1” large company CEO pay multiple compared to average US employee pay as both the primary symptom and the definition of inequality.1 Inequality is more precisely and typically defined in economics as the percentage of total national income earned by the top percentages of households or taxpayers (e.g., top 1% or top .1%). Using this definition, it is well-documented that US income inequality, historically among the highest relative to other developed countries, has continued to increase significantly. CEO pay also rose over that period. CEO pay at the largest companies in the US over the past 30 years has grown much faster than average wages—approximately 10.8% versus 4.2% in nominal dollars.2, 3 This is the mechanical explanation for the current differential between CEO and average worker pay—the well-known 300:1 ratio. However, growth in this differential was not an “overnight event.” The rising ratio was the result of very different long-term labor market factors4 which yielded consistent high single digit or low double digit pay increases for top managers over several decades combined with lower wage growth for workers with less valued skills in the market. But is this economic reality the result of failed corporate governance? We explicitly explore this issue below. How much of the increase in inequality has been caused by CEO pay, and is this a failure of corporate governance? 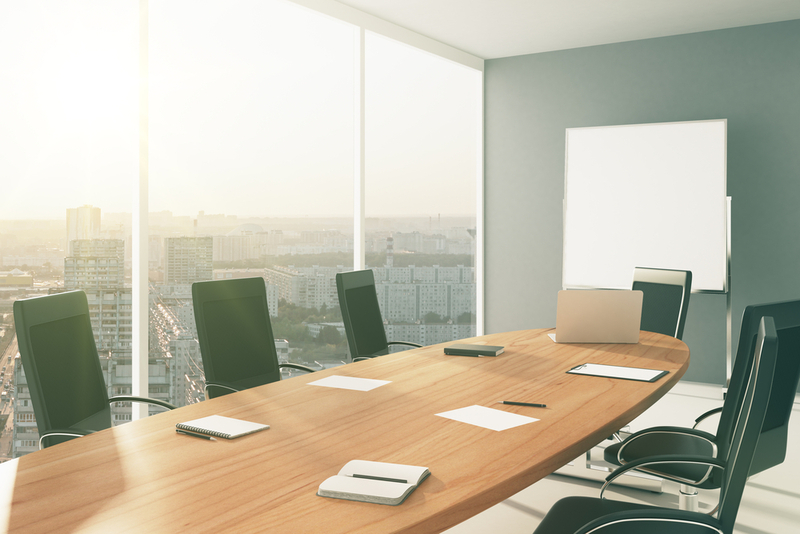 This Viewpoint will provide some insights for directors and others into the answers to these questions in the context of the SEC’s mandated disclosure of the ratio of CEO to median employee pay. Informed commentary on inequality, including the Conference Board’s recent paper, “Tackling Economic Inequality, Boosting Opportunity: A Blueprint for Business,”5 cites globalization and technological advancement (e.g., office and manufacturing automation) as two driving forces of the recent increase in income inequality in the US. While both phenomena have made material goods more affordable for US consumers, they have also resulted in wage growth that lags the growth in productivity for those workers not participating in high-skill, technology-oriented labor markets or global commerce. Many commentators cite “excessive” executive pay as one of the primary causes of income inequality.6 Such “excessive” executive pay, they argue, has been created or at least enabled by low/declining marginal tax rates in concert with poor corporate governance practices (e.g., cronyism between the board and the CEO).7 For valid reasons, directors may be inclined to focus on the governance of their own company’s executive compensation programs and ignore the public debate on inequality, some of which is flawed. 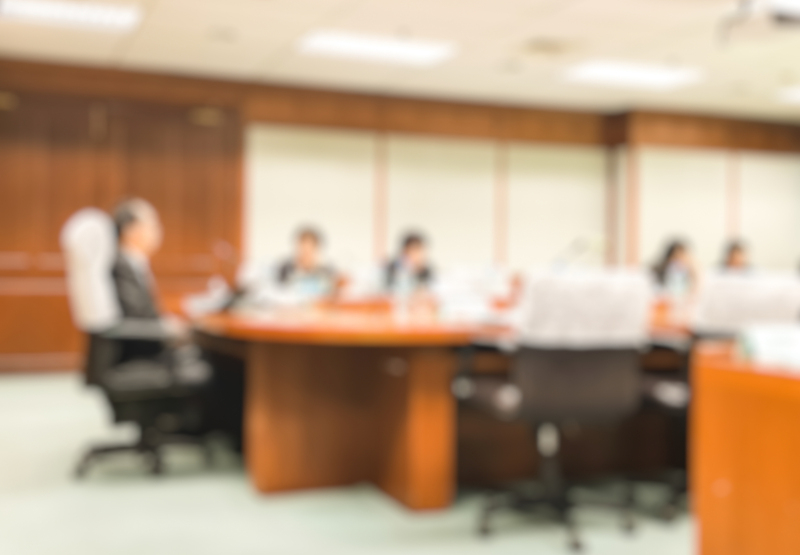 However, the public discourse can and does enter the board room when directors must consider the media implications of executive compensation decisions. Most importantly and directly, the SEC’s mandate that public companies disclose the ratio of CEO pay to median employee pay in 2018 proxies will bring the discussion of income inequality further into the Compensation Committee. Supporters of the pay ratio believe that this disclosure will reduce excessive CEO pay at many companies, allegedly caused by weak governance.8 Their theory is that this reduction will lower the 300:1 large company pay multiple thereby reducing inequality; this theory was the genesis of the Dodd-Frank CEO pay ratio.9 Further, income inequality and the ratio of CEO pay to average US worker wage have been cited in at least one shareholder proposal requesting supplemental reporting on the CEO to employee pay ratio and an explanation from the company regarding whether broad-based layoffs or pay cuts warrant changes to executive pay. Therefore, it is critical that Compensation Committee members maintain a perspective and philosophy from which to govern executive compensation in a world where income inequality is a major public policy issue. 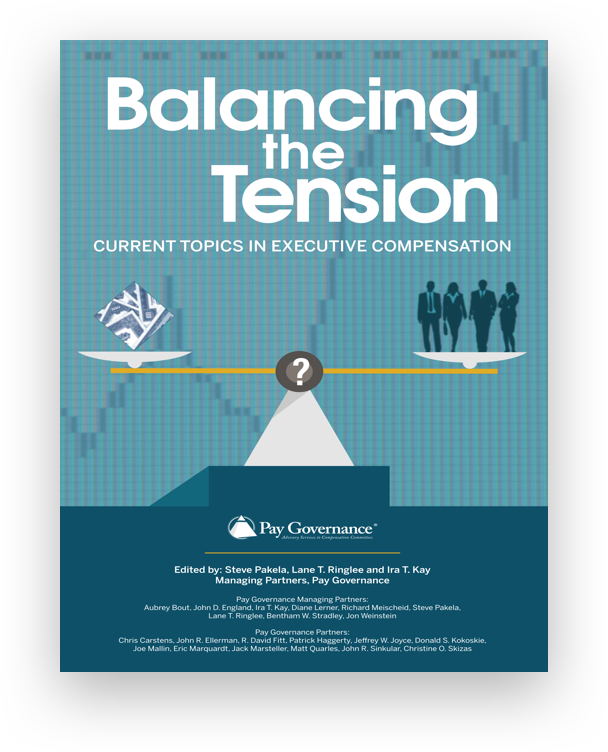 This viewpoint addresses several key questions and criticisms regarding the economics, corporate governance and structure of executive compensation as they relate to the broader issue of income inequality. Question 1: Is the recent increase in US income inequality caused primarily by the increase in the number of public company executives in the top .1% of earners? No, not primarily. Clearly, corporate executives have among the highest paying jobs in the US economy (along with lawyers, finance professionals, entertainers and athletes), and growth in executive pay levels of corporate executives at publicly-traded companies explains some of the increase in income inequality in the US. Nevertheless, a definitive study on the occupations of high income taxpayers demonstrates that the compensation of public company executives is not the primary cause of the increase in inequality. Question 2: Alternatively, is the recent increase in US income inequality caused primarily by the increase in the aggregate pay levels of public company executives in the top 1% and .1% of earners? No. The data in Table 1 shows that it is not the increase in the relative number of executives in the top .1% that is the primary cause of the increase in income inequality for the top .1%. Next we explore whether the increases in the aggregate pay levels of the highest paid public company executives is a primary cause of the increase in income inequality. The same data set from Bakija referenced above shows the trends of the incomes for the various professional groups representing the .1% of income earners—see Table 2. 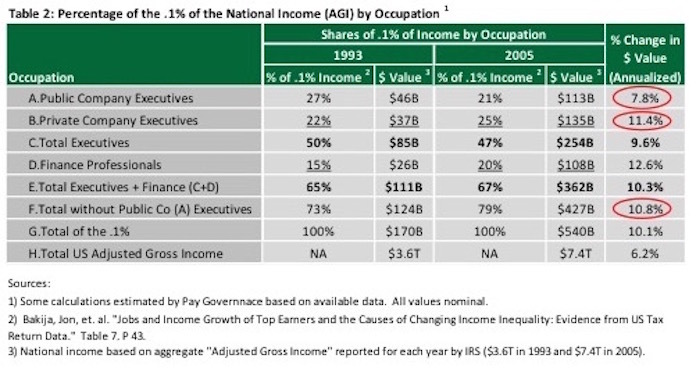 Specifically, the 7.8% twelve year [1993-2005] annualized increase in aggregate taxable income for the public company executives, while higher than the 6.2% growth in total gross income, was much lower than the 11.4% annualized increase in incomes for private company executives, the 12.6% increase for finance professionals, and the 10.8% increase for all of the .1% income bracket excluding public company executives. Question 3: Is CEO pay aligned with the performance of their employer? Yes. An important consideration in the inequality/CEO pay debate is whether the pay of executives is aligned with the performance of the company that he or she manages. This is arguably the key factor that is under the control of the Compensation Committee. The objective reality is that the vast majority of companies are doing an excellent job of ensuring such alignment. Question 4: Have corporate governance failures caused excessive executive compensation levels at public companies, thus exacerbating the inequality issue? Generally, no. 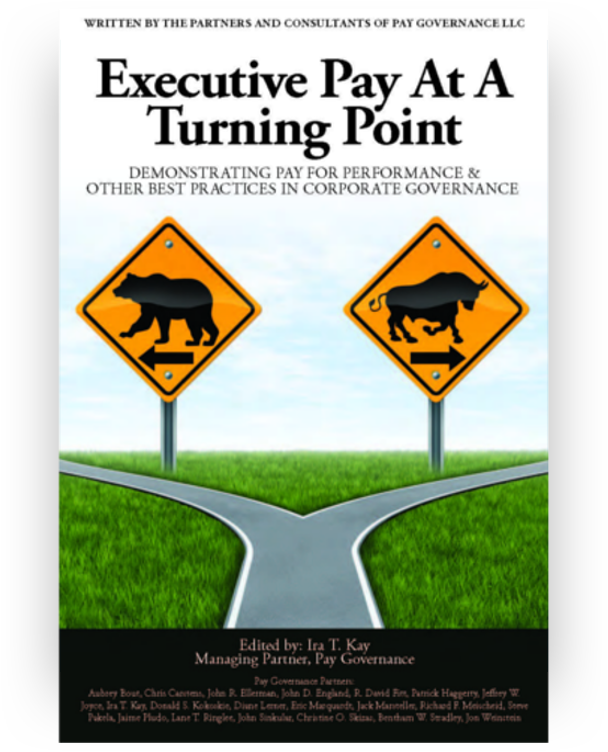 Many critics, when pressed for a mechanism by which corporate executive compensation is set inappropriately, cite flawed corporate governance as the driving force behind executive compensation growth. These criticisms have two aspects: too much focus on creating shareholder value [rather than adding other stakeholders]15 and specific policy flaws in the governance process that weaken board oversight on executive pay. We present several perspectives on the US corporate governance climate that refute these claims. In fact, governance has improved substantially over the past 20 years, the same period during which executive pay increased. Further, shareholders appear highly satisfied with the US executive pay model which is heavily linked to the creation of shareholder value. Yes. Using numerous standardized and researched metrics, US corporate governance has improved and public companies have addressed many prior criticisms.16 These improvements in governance best practices17 include: a significant increase in shareholder outreach; an increase in the percentage of independent directors; annual elections for directors; more separate chairs and near universal prevalence of lead directors; independent board nominating committees; elimination of “poison pills”; enhanced proxy disclosure and proxy access; among others.18 Specifically, in executive compensation governance, there have also been many changes/improvements responding to shareholders, proxy advisors and political pressures: say on pay votes; elimination of single trigger stock acceleration and excise tax gross-ups at a change in control19; reduced pensions; introduction of anti-hedging and anti-pledging policies; increases in performance vesting for stock grants; introduction of clawbacks; etc. While some of these are disputed as true enhancements, taken in total, US corporate governance has improved significantly while executive pay has increased.20 These improvements are a direct rebuttal to the “weak governance of CEO pay” explanation of inequality. Some critics argue that poor governance by public company Boards and Compensation Committees has caused the excessive growth in public company executive compensation. However, as illustrated in Table 2, the 11.4% income growth for private company executives in aggregate (relative to 7.8% for public company executives) refutes the arguments criticizing public company governance. Private company executive compensation is set either by individual private company shareholders or a Committee of private equity managers who hold a direct stake in the financial success of the companies. Said another way, there is no separation between the shareholders (principals) and the Committee setting pay for the executives. Even in this supposedly superior governance environment, income for highly-paid private company executives, in aggregate, grew faster than those for public company executives. This suggests that private equity owners, just like public company shareholders and the Boards that represent them, believe that using large amounts of performance-based equity grants is the best way to align executive management’s personal interests with the financial interests of the owners of the company. Collectively, these are strong arguments that the CEO pay ratio for a particular company will be indicative of market-driven industry, size and performance factors rather than a failure of corporate governance. Question 5: Are shareholders dissatisfied with the US executive pay model? No. Corporate shareholders certainly appear to agree with the current executive compensation structure. As a group they have provided an advisory vote in favor of executive compensation programs at the vast majority of companies. Specifically, there have been only 290 failed say-on-pay votes among 13,758 say-on-pay votes for Russel 3000 companies - a failure rate of just 2.1% - over the past six years.22 This is a stunning statistical indicator of shareholder support. Even ISS, the influential proxy advisor to institutional investors, recommends a “for” vote for nearly 90% of companies. These statistics indicate that the shareholders are highly supportive of the current pay-for-performance model for US public companies overall. This support appears to include the broad emphasis on incentives for shareholder value creation that most US companies utilize. CEO pay ratios need to be viewed in the context of this broad shareholder support. The conclusion of our research is that relatively high executive compensation at public companies, allegedly enabled by compliant boards, is not the primary explanation for rising income inequality in the US. 1) Ensure that competitive executive compensation opportunity levels are monitored annually against the median of an appropriately-sized peer group. This will provide a robust context for the CEO pay ratio. 2) Ensure that executive compensation program design provides appropriate pay-for-performance linkage, including setting challenging performance goals and providing the majority of compensation in long-term equity. 3) Apply best-practice compensation policies including robust stock ownership guidelines, clawback provisions, and prohibitions on hedging and pledging company shares to further link executive income and wealth to the performance of the company. 4) Maintain strong corporate governance practices including nominating directors using an independent Nominating Committee, using independent compensation consultants and legal counsel, and holding executive sessions at each Compensation Committee meeting. 5) Ensure that all employees are competitively and appropriately paid relative to the profitability, fairness and economics of the company. 6) Consider whether the Compensation Committee should review supplemental analyses related to the CEO pay ratio and broad-based pay practices (e.g., comparison of executive versus broad-based pay increases, review of number of employees covered under benefit programs, and review of pay ratio and median employee data to peers). 7) Consider how the Company will address and explain the disclosure of the ratio of CEO to median employee pay in the 2018 proxy. Since supporters of the CEO pay ratio believe that this disclosure will reduce “excessive” CEO pay caused by weak governance, companies may need to be explicit in responding to this theory. The data and analysis presented here could help in this regard. 1. Trottman, Melanie. “Top CEOs Make 373 Times the Average US Worker.” New York Times. May 13, 2015. http://blogs.wsj.com/economics/2015/05/13/top-ceos-now-make-373-times-the-average-rank-and-file-worker. 2. CEO pay compound annual growth calculated based on: Lawrence Mishel and Alyssa Davis. “CEO Pay Has Growth 90 Times Faster than Typical Worker Pay Since 1978.” Economic Policy Institute. July 1, 2015. http://www.epi.org/publication/ceo-pay-has-grown-90-times-faster-than-typical-worker-pay-since-1978/. 3. Average wage growth calculated based on: Social Security Administration. “Average Wage Index (AWI).” https://www.ssa.gov/oact/cola/awidevelop.html. 4. Ira Kay, et al. Executive Pay At A Turning Point. Pay Governance. 2012. P 15. [Describing the substantial difference in the labor markets for top executives and the average employee]. 5. The Conference Board. “Tackling Economic Inequality, Boosting Opportunity: A Blueprint for Business.” April 2016. https://www.ced.org/pdf/CED-Inequality-Report.pdf. 6. Thomas Piketty. Capital In The Twenty-First Century. 2014. Cambridge: Belknap Press. P302. 7. Thomas Piketty and Emmanuel Saez. “Why the 1% should pay tax at 80%.” The Guardian. October 24, 2013. https://www.theguardian.com/commentisfree/2013/oct/24/1percent-pay-tax-rate-80percent. 8. Joe Pinsker. “When Workers Know Exactly How Much More Money CEOs Make, Will Anything Change?” The Atlantic. August 6, 2015. http://www.theatlantic.com/business/archive/2015/08/will-the-pay-gap-between-ceos-and-workers-ever-get-smaller/400601. 9. Sarah Anderson. “This is why your CEO makes more than 300 times your pay.” Fortune. August 7, 2015. http://fortune.com/2015/08/07/ceo-pay-ratio-sec-income-inequality. 10. Thomas Piketty. Capital In The Twenty-First Century. 2014. Cambridge: Belknap Press. P302. 11. Jon Bakija, et al. “Jobs and Income Growth of Top Earners and the Causes of Changing Income Inequality: Evidence from U.S. Tax Return Data.” 2012. http://web.williams.edu/Economics/wp/BakijaColeHeimJobsIncomeGrowthTopEarners.pdf. 2005 is the most recent year of the data; there is a high likelihood that this trend has continued or possibly increased (e.g., given the hedge fund managers [private companies] make multiples of public company CEO Pay). Bakija provides data on both the 1% and .1% with the most detail on the latter. Results for the top .1% are directionally consistent with other top percentiles. Bakija’s research mostly combines public, private and finance companies to draw his conclusions about the significant growth in inequality. However, his primary approach is not useful in isolating the potential impact of weak corporate governance on excessive public company executive pay. Findings presented in this Viewpoint are based on our interpretation of Bakija’s data. 12. Dean Starkman and Samantha Masunaga. “CEO pay-ratio rule likely to heat up debate on income inequality.” LA Times. 8/5/2015. http://www.latimes.com/business/la-fi-ceo-pay-gap-20150805-story.html. 13. Steven Kaplan and Joshua Rauh. “It’s the Market: The Broad-Based Rise in the Return to Top Talent.” Journal of Economic Perspectives. Summer 2013. https://www.aeaweb.org/articles?id=10.1257/jep.27.3.35. 14. Lane Ringlee, et al. “CEO Realizable Pay and Performance: a 10-Year Analysis.” November 22, 2013. http://paygovernance.com/ceo-realizable-pay-and-performance-a-10-year-analysis-3. 15. Lynn Stout. “The Shareholder Value Myth.” Harvard Law School Forum on Corporate Governance and Financial Regulation. June 26, 2012. https://corpgov.law.harvard.edu/2012/06/26/the-shareholder-value-myth. 16. Bengt Holmstrom and Steven Kaplan. “The State of U.S. Corporate Governance: What’s Right and What’s Wrong?” European Corporate Governance Institute. 2003. http://leeds-faculty.colorado.edu/bhagat/CorporateGovernance-RightWrong.pdf. 17. Paul Gompers, et al. “Corporate Governance and Equity Prices.” National Bureau of Economic Research. 2001. https://ideas.repec.org/p/nbr/nberwo/8449.html. 18. Mark Gerstein, et al. “The Resilient Rights Plan: Recent Poison Pill Developments and Trends. Latham & Watkins. July 2014. https://www.lw.com/thoughtLeadership/2014-poison-pill-developments-and-trends. 19. “Change-in-Control Equity Acceleration Triggers.” Equilar. March 19, 2014. http://www.equilar.com/reports/8-change-in-control-equity-acceleration-triggers.html. 20. Steven Bank, et al. “Executive Pay: What Worked?” UCLA School of Law. August 16, 2016. http://papers.ssrn.com/sol3/papers.cfm?abstract_id=2812349. 22. Source: ISS Voting Analytics. 2016 YTD results as of 6/24/2016. General questions about this Viewpoint can be directed to Ira Kay or Blaine Martin by email at: ira.kay@paygovernance.com or blaine.martin@paygovernance.com.